The folks over at Guernica, included it in ENDNOTES with a couple of other essays and articles, including a sharp, gorgeous essay in The New Yorker “Why is Academic Writing so Academic”? I had it in mind. And I had it in mind when I read“The Tenure Code” a post about a tenure case that fell apart because the word “solid” was used by an external reviewer to describe the candidate’s scholarship. Written by the ultimate insider, a 20-year veteran of an elite private school, the post both discusses and exemplifies the problems with twenty-first century notions of merit and shows just how absurd and arbitrary the tenure process, steeped as it is in the hocus pocus of meritocratic fantasy, can be. Ilan Stavans uses this tenure case to point out what is wrong with the process at Amherst College, and I would posit that what ails Amherst trickles down on the rest of us. I’m particularly interested in a few claims Stavans makes. To be elected to the C6 they must have spent about a decade making themselves known in the community, which in turn makes them electable. By this time, the demands for tenure have changed from when they went for tenure. So they often demand of a candidate’s record more—much more—than their own records are able to display. This means that by their own implausible standards they wouldn’t receive tenure themselves. Let’s pause for a minute to unpack this. It takes about ten years to build the credibility required for election to the committee. On the one hand, this could be a positive. Having a sense of an institution’s history and goals and a stake in its success is why tenure and faculty governance should matter. But the problem is that too many academics seek only to affirm their own experiences and ideas rather than judging the file in front of them. Stavan quips “Everyone knows the formula: Academics + power = mendacity” and he’s right, but what I want to understand is how this formula stays in place. I know how it was put in place. Those who devise the systems of evaluation in higher education are suspicious of their own notions of merit and so develop ever-absurd hoops for faculty to jump through. And jump you must. There’s no use wringing your hands or shaking your fists at the system. You can, but they’ll fire you and fill your place with an equally qualified adjunct,and then with a visiting assistant professor in a position that might eventually turn into a tenure-track position that will lead to a national search where there is little or no chance of the adjunct or the visiting assistant professor making the shortlist. Fighting pre-tenure is not a plan. But there are those who can fix. They have power. By “they” I ultimately mean the upper administration, but it’s also those committees like the C6 at Amherst. This is a committee comprised of tenured faculty from different disciplines who have no real understanding of fields outside of their own. The tenure track pushes new professors to hew to a fixed path, so part of being successful is not just maintaining an active research agenda but maintaining one approved by the institution. Straying from that can lead to problems and the strategy developed to gain tenure too often solidifies into practice.”Academic freedom” becomes a banner to fly to protect speech and ideas instead of as a tool to dismantle unfair review processes. Exceptionalism at Amherst is such that the C6 expects—and the college community expects the C6 to expect—outside reviewers to use only exceptional language in tenure letters. If a candidate isn’t “superb,” “extraordinary,” “unparalleled,” “remarkable,” and “at the top of her field,” then the assessment is coded with mediocrity: Good isn’t good enough. Even when exceptionalism isn’t the goal, tenure files can be torpedoed by poorly worded letters. I shudder to think about what happens when the candidate works in a marginalized field that might not be taken seriously by her own department never mind a campus-wide committee like the C6. 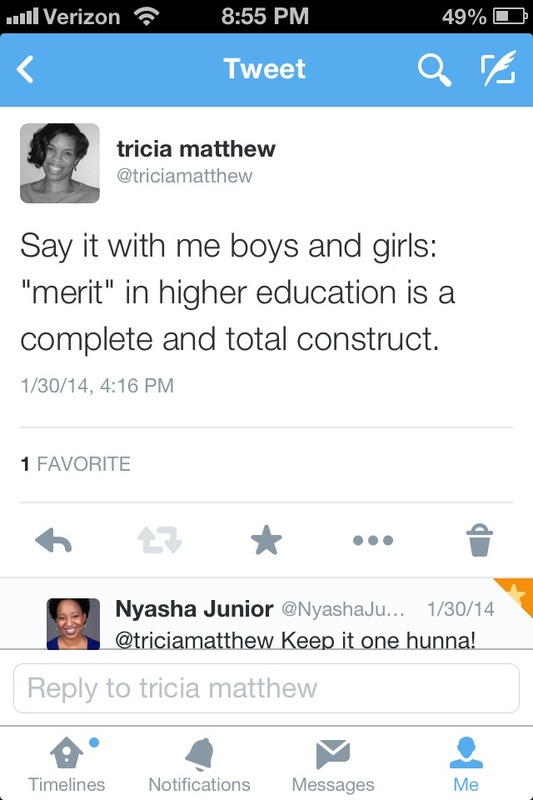 And, if you’re thinking, “well clearly we need to put some people of color on the C6 committee, Tricia” I would answer that those committees need more than “some” people of color—more specifically they need people of color who have managed to gain institutional credibility–the kind that comes not just with tenure but with tenure in departments that have a firm footholds at their colleges and universities. So when UT Austin fires faculty working in ethnic studies, and UCLA has a program instead of a department of Afro-American Studies and Princeton offers certificates but not degrees in African Studies, Latino Studies, Latin American Studies, South Asian Studies** it is difficult and perhaps even impossible to build a coalition of faculty who have the credibility to make substantive contributions to personnel processes. Personally, I get an average of between six and eight tenure-evaluation requests a semester. Such is the volume, let alone my other commitments, that I regularly decline, often to all, unless the candidate is a former student of mine. 12 to 16 is a lot, so managing the flow is required, but I am particularly interested in who gets a yes from him, specifically his academic kin. To use Hayes as a hammer, perhaps more bluntly than he might want me to, even as Stavan is critiquing a system he is perpetuating it by only helping out his own. And who can blame him? He is right when he discusses the amount of work that goes into these reviews, though I’m hearing that letters from former professors are falling out of favor (I suspect that what happens is that external reviewers engage in some sort of you-write-about-my student/friend/ally-and-I’ll-write-about-yours). I’m told that in some institutions, declining such invitations amounts to a rejection ending up in the candidate’s files. For that reason, I do what I most dislike but others have suggested as the pertinent approach: I don’t respond. The reason I decided to title the anthology written/unwritten is precisely because of these silences, the gap between what is said explicitly and what is deliberately left unsaid, those unwritten moments that may speak more than anyone intends. In this case, silence does not mean lack of support for a candidate’s work but lack of time to support a specific candidate (or perhaps it means both things at once). The unwritten goes beyond damning with faint praise. 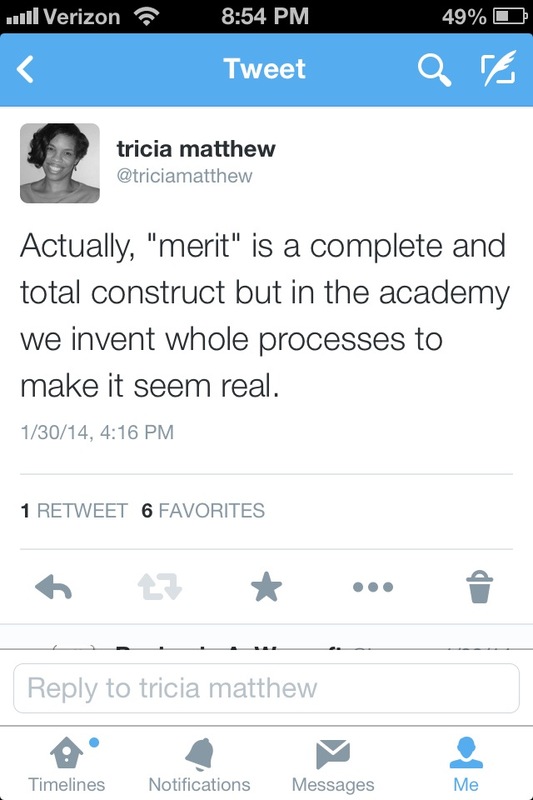 And when what is written includes words like “solid” in a place where everyone is exceptional and, (even though this is actually impossible), everyoneis above average there is no room for even the mythology of merit. Recent trends in national politics and popular culture suggest that race is now an antiquated or problematic category of human differentiation. Race is currently considered nebulous and ubiquitous, if not a flawed code that hearkens back to an archaic past. Supposedly, phenotypes or genetic material cannot sustain the biological connectivity between humans. Students suggest as much when they don tee shirts that state: “We Are All Africans” (thereby emphasizing that all humans originate from Africa despite their visual classification). Meanwhile, contemporary academic studies reflect the same stance: the category is useless in the face of transgressing experiences of oppression or cultural amalgamation (e.g. Against Race, The Melancholia of Race, and Desiring Whiteness). Yet many discourses emerging from black studies and critical race studies expose such ideals of non-race as a proponent and signal of dominant white culture rather than as an actual liberation from race, and many groups assert and “stand by” their racial category, remaining resiliently vocal about the pleasures of their demarcated belonging. Further, many racial minorities recognize and resist the nuances of aversive racism lurking behind decisive leanings towards racelessness and contemporary versions of colorblind ideals. Recognizing that the struggle towards freedom from race has merits, this anthology, then, seeks essays that approach racelessness from the vantage point of blackness rather than the standard normative proffered by neutral models that may mask whiteness. Tangled as the topic may seem, transcending race by way of the racialized rather than the race-free or race-neutral—which dangerously places the parameters of discourse within the scope of whiteness—sets this collection apart from other attempts to devolve race. Other approaches may serve to reduce the experiences and pleasures of specific target identity group belonging. Transcending efforts—attacks on affirmative action, attacks on black studies, claims of racial equality met via the Obama-era pact—deny that the characteristics/distinctions/powers of specific group membership carry their own positive insignia. Within the varied contributions of black expression and the distinct responses to historical moments wherein Western European groups relied on and targeted African descendants for expansion/economics/psychical anxiety, black expression continues to firmly refute the race-transgression trend; blackness moves the discourse away from race but maintains the more evasive and elastic term blackness. Many assert that while race is a problematic restriction, blackness remains useful as a means of self-expression, self-recognizing epistemology, and cultural aesthetics. Papers that pursue how blackness (U.S. and global) can and does exist without responding to or depending on “race” are also welcome. Few studies have explored how race might be quashed while blackness is both culled and intact. Ideas for papers on art, literature, film, philosophy, religion, food, dance, music, and media are invited to exchange ideas about how blackness works in this way. Deadline for full essays of 7500 words is January 15, 2014. Please submit word document essays using MLA citation system. Additionally, please submit a 300-word abstract preceding the full essay submission and a brief academic bio of all contributors. Wang Ping is suing Macalester College for claiming that they discriminated against her when she applied for promotion. Court documents note that a white, male colleague in the same department also applied for promotion around both times Wang applied, and was granted the promotions on both occasions, despite the fact he had fewer published works and less service to the community. There were also documented procedural violations in the promotion process. In her landmark study of race and American literature, Playing in the Dark (1992), Toni Morrison argued that literary history has taken for granted a certain set of assumptions, including the understanding that “American literature is free of, uninformed, and unshaped by the four-hundred-year-old presence of, first, Africans and then African Americans in the United States” and that “this presence […] had no significant place or consequence in the origin and development of that culture’s literature” (4-5). Morrison’s work provides a thoughtful and insightful study of race in American narrative and has inspired a generation of scholars to continue the study of race and ethnicity in American literature. However, much of this work (but certainly not all, as evidenced by Frederick Luis Aldama’s recent collection Analyzing World Fiction: New Horizons in Narrative Theory [Texas, 2011]) tends to fall outside the scope of formal narrative studies. And just as Susan Lanser’s 1986 ground-breaking article “Toward a Feminist Narratology” has inspired scholars to explore the fruitful possibilities of a feminist narrative theory that engages an intersectional approach to issues related (but not limited to) gender, the editors hope to compile a collection of essays that similarly engages the study of race, ethnicity, and narrative in the Americas, a cultural-geo-political area that we conceive of broadly that is not simply bounded by the nation-state of the U.S. Following Aldama’s collection, we hope to provide a work that encompasses a diversity of voices, subjects, and approaches to the study of narrative, race, and ethnicity. To that end, we invite proposals for a collection of essays that will examine the intersections of race, ethnicity, and narrative focused on texts produced by authors with cultural ties to the Americas, a region that has seen the widespread sale of African slaves, the decimation of indigenous peoples in the wake of European colonialism, the hybridization of settler-colonials with roots in Spain, and the systematic mistreatment of Asian immigrants, as well as a cultural history that has needed to be ever-mindful of that heritage. It is the belief of the editors that “the Americas” share a unified cultural history, particularly with respect to issues of race and ethnic identity, and that narratives produced by artists in many American nations reflect that shared history. As such, the editors would like this volume to include as many diverse voices, backgrounds, and identities as possible. We seek proposals for essays that will address the various ways that the formal study of narrative intersects productively with methodologies of critical race studies, post-colonial theory, and general ethnic studies. In other words, following the example set forth by Lanser, how can issues of identity help us better understand the workings of narrative, and how can a formal study of narrative assist us in the study of narrative forms? We seek essays that engage the diversity of possible theoretical approaches, as well as works that explore a multiplicity of ethnic voices and audiences. We do not wish to define what it means to study narrative, race, and ethnicity in the Americas; rather, we hope to provide a starting point for the variety of directions such a study can take. Proposals for essays should be between 750 and 1000 words and should clearly articulate their theoretical position and identify the narratives to be analyzed. Completed abstracts are due by March 31, 2013 and can be sent to James J. Donahue (donahujj@potsdam.edu), Jennifer Ho (jho@email.unc.edu), or Shaun Morgan (dmorgan@twcnet.edu). We welcome questions or inquiries about this volume prior to this date, as well. Submitters will be notified about the status of their proposals by May 31, 2013 and final essays of 5,000-6,000 words will be due on January 31, 2014. Although we do not have a formal agreement with a press just yet, an editor for the Ohio State University Press Series on the Theory and Interpretation of Narrative has expressed strong interest in reviewing this collection. — are narrative approaches grounded in the study of race and ethnicity methodologically different from narrative approaches grounded in the study of gender or class; and if so, how?